Trident Group is one of the fast growing Heavy Engineering Company involved in Steel Fabrication & Machining. Fabrication of Steel, Assembly of Steel Structure, Material Handling Equipment and Industrial process Equipment and Heavy & précised machine components & assemblies. Trident was founded in 1999 by Late Shri Madhur Agarwal after doing his MBA from Australia for Manufacturing of gas filled shock assemblies first time in India with Italian collaboration. In 2007 company got a new vision and Trident moved its focus towards Heavy Machining & Fabrication Assemblies. Today the Group has Heavy State of Art Manufacturing facility at 3 different locations in Kanpur. Trident has all the Modern facilities of design & development of components with the tools like CNC Oxy/Plasma cutting, CNC Laser, Welding tears formers/rectifies, TIG, MAG, MIG, semi automatic Submerged Arc welding, welding booms, Manipulates & Robotic welding and foe Machining facilities CNC Plano Miller, CNC turning, CNC vertical machining centre, 5 Axis Machine, CNC Horizontal Machining centre, CNC Pipe Bending & supporting machines with material handling facility up to 80 tons. This makes Tridents to Manufacture single piece up to 70 tons and has a capacity to manufacture 1500 tons per month. 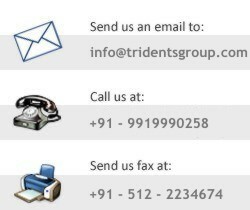 Trident caters to various business segment like Railway, Power, Defence. Considering the growth domestic demands as well as the fact that many of the international buyers are turning to India, Trident group is gearing up towards increasing its production capacity to take advantage of the lucrative growth opportunities, and is guide confident of being are of the leading contenders for high value projects.